After a positive start, the week’s trading turned negative Wednesday afternoon and the markets finished the week 0.77% lower. Traders weighed the facts behind the Fed’s decision to hold its Fed Funds rate steady and caution was the dominant mood. Chairman Powell’s description of the economy as being “in a good place” were weighed against concerns about the slowing growth rates in some segments of the economy. Bears got excited about the inversion of the yield curve, pointing out inversions are precursors of recession. Below are examples of the Treasury yield curve last Friday along with the yield curve, 12 years ago, ahead of the 2008-09 recession. 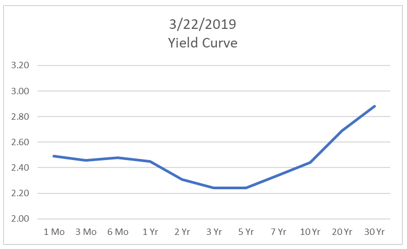 Friday’s yield curve is slightly inverted but only at the shorter end of the curve. As Crocodile Dundee might say, “That’s not a yield curve inversion”. 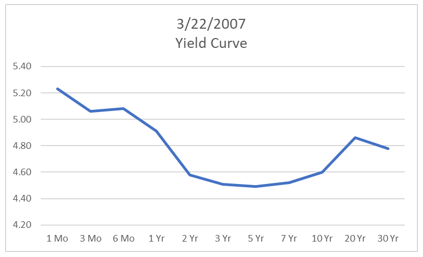 For comparison, the yield curve from 12 years ago is displayed below. Our hero would continue, “That’s a yield curve inversion”. Short-term rates clearly exceed long-term rates and that inversion did preceded a real recession in 2008-09. For your enjoyment, the brief YouTube clip of the original Crocodile Dundee quote. Perhaps Jerome Powell is closer to the current state of the economy and we are, in fact, in a good place. Factory orders rose a modest 0.1% in January following the 0.1% increase in December. Initial unemployment claims declined by 9,000 to 221,000. The four-week moving average for initial claims rose 1,000 to 225,000. Continuing claims fell 27,000 to 1.750 million. The Philadelphia Fed Index rose back into expansion territory in March with a reading of 13.7, up from the index level of -4.1 in February. The Index of Leading Economic Indicators rose 0.2% in February, the first increase in five months. The Coincident Economic Index also rose 0.2% and the Lagging Economic Index was unchanged. Existing home sales rose by 11.8% from January to February. While the largest monthly jump since December 2015, sales remain 1.8% below year ago levels. Aside from the modest gains the reports itemized above, along with the still negative year-over-year existing home sales level, there were no outright negative data releases. The Fed saw no reason to either raise or reduce its fed fund rate this week. Fed chairman Powell explained Fed policy is where it needs to be based on current economic conditions. 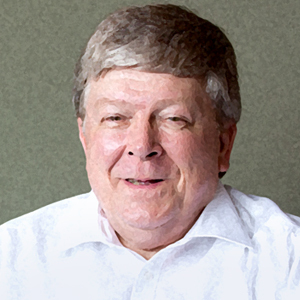 Policy is based on the belief that the economy is continuing its expansion, though not at the same rate we experienced in 2018, and consumer price increases continue at the Fed’s 2.00% target level. The Atlanta Fed staff has begun to adjust its sensitive Q1 GDPNow forecast upward, raising it to 1.2% from 0.4%.